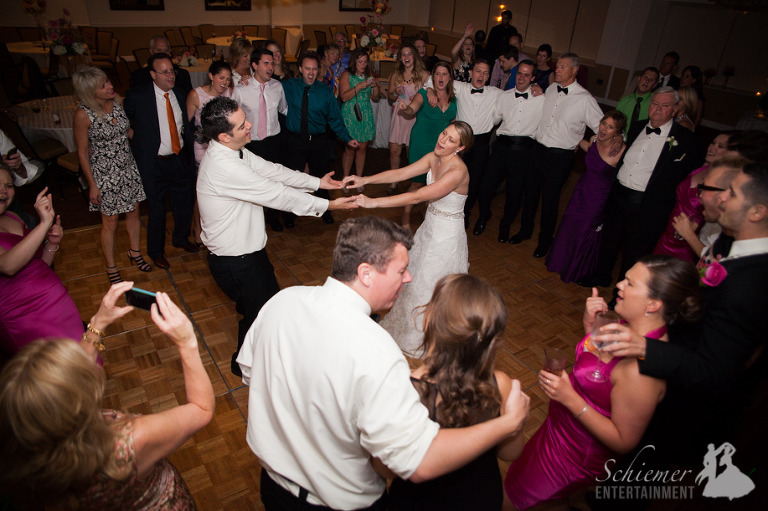 A 6 hour wedding reception typically includes around 115 songs. From cocktails until the last song, a couple must choose how to spend their time to have the day of their dreams. Lucky for me, Laura and Brad wanted lots of time for dancing and visiting with their guests at their fantastic celebration at The Rivers Club, in downtown Pittsburgh, PA.
Laura and Brad included only the events which were most important to them, including a wonderfully choreographed first dance to John Legend’s “All Of Me”. 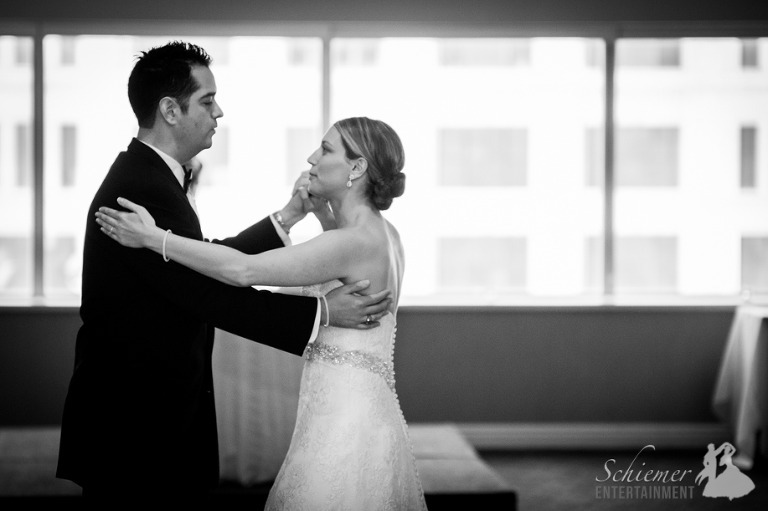 I really admire couples who take the time and effort to make their dance so special. Thanks to their planning, the newlyweds ended up with over 3 hours to dance, sing, and enjoy time with their closest friends and family. With so much time, the playlist included a wide variety of music so everyone could enjoy themselves. Laura and Brad are now off on a well deserved honeymoon in San Francisco and then Hawaii! I believe that the success of wedding day depends completely on the happiness and love of the newlyweds. We’ve all seen the downside of this on countless episodes of Bridezillas. I find it magical when a couple radiates so much positive energy that their guests have no choice but to be caught up in the excitement and romance of the day. 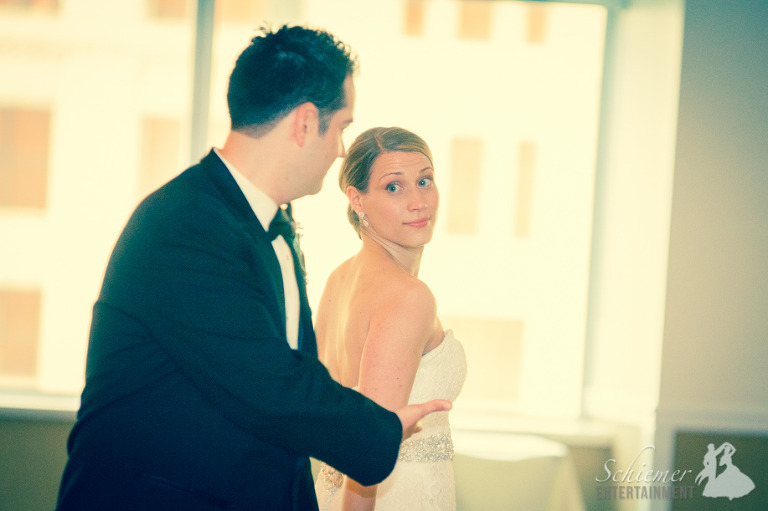 I can’t think of a better example of this than the reception of Christy Steidel and Matthew Crummy, held at The Rivers Club in downtown Pittsburgh, PA. While I know every bride anticipates her wedding since childhood, Christy had an excitement that came through every time we talked, emailed, and met. It was so infectious! It was clear throughout the night that both Christy and Matt were enjoying every second. 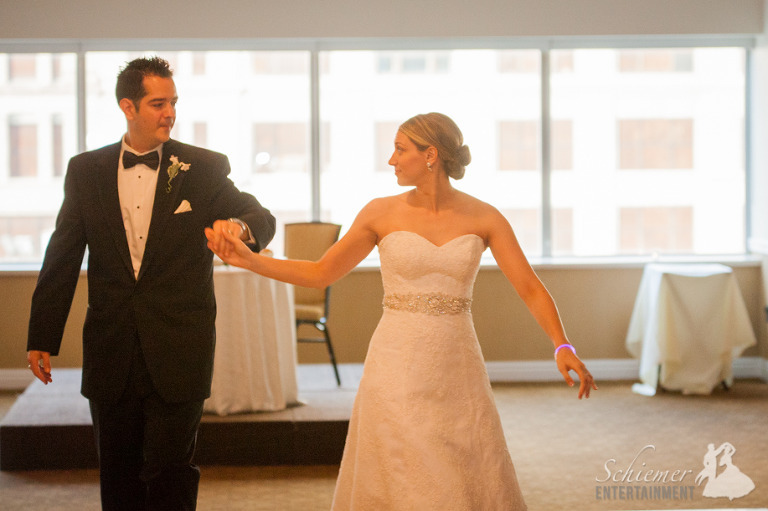 The first dance was sweet and elegant, such a beautiful bride! The music flowed perfectly with the energy of the evening. Cocktail and Dinner featured a great mix of Rat Pack and modern crooners. When the dancing picked up there was a great variety of music for all ages. I had the pleasure of meeting some of Christy’s family before the wedding. Her father, Michael Steidel, was a big help with the details. I loved getting to see him dance with his “little girl”. Not to be outdone, Matthew and his mother Martha danced next, and even included a few spins! All of the guests were so caught up in everything that the dance floor flooded with people right away. Christy and Matthew were so wonderful to refer me to their friends Joe & Sarah. I’m excited to get to DJ at THEIR wedding this May! I see a lot of beautiful wedding dresses, but Christy’s is one of my all time favorites. Clearly it was made for the dancing bride, since later in the evening she was able to remove the bottom! People like Christy and Matthew are why I devote my time to being the best wedding DJ I can be. Their energy, love and excitement was so incredible every time we met, I knew their wedding would be the party of a lifetime! The newlyweds are currently off on a Mediterranean cruise where I’m sure they’re loving every moment.